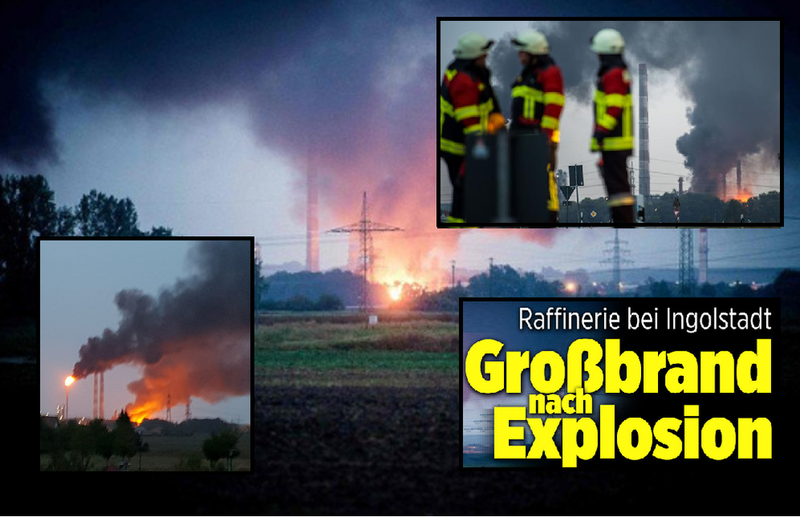 An explosion and subsequent fire in a major oil refinery near the city of Ingolstadt (in the Bavaria region near Munich) saw some 2,000 evacuated from their homes. The cause of the explosion remains unclear at this point. Several people were left injured, with some needing to be hospitalized. The police statement shows that part of the Bayernoil complex caught fire around 5.15 am in the morning. Eight employees were injured and three were hospitalized, some with life-threatening injuries. As a precautionary measure, some 2,000 residents in a 5-kilometre radius were evacuated due to the heavy black smoke while everyone in a 20-kilometre area around the refinery was advised to close their windows. Air tests around noon would be used to conclude whether it was safe for people to return to their homes. A number of fire brigades, rescue services and technical relief organizations from the Ingolstadt and Munich area were deployed whilst over 200 firefighters are still at the scene. The Donaukurier local newspaper reported that a number of small explosions could be heard after the initial larger blast with the sound carrying several kilometers. Authorities cordoned off the area to prevent onlookers from getting too close to the scene and to minimize any danger given the heavy chemicals that are stored on the site. Bayernoil has been operating the oil refinery in Vohburg since 1967. Either sand nigs or some other variety of jew puppet. Keep it up kikes, the Aryan is yet to rise. Could have been and accident or Terrorism? Here in Atlanta we have a Major FUEL tank farm that stores all of Metro-Atlanta's and the 4 surrounding states vehicle fuel. Which strangely has the Masjid At-Taqwa Mosque a grenades throw away along one side.